In the summer of 1942, Hitler's armies initiated 'Operation Barbarossa', a campaign aimed at seizing the oil fields of the Caucasus, thereby depriving the Soviet war effort of its much-needed supply of oil. The Germans advanced downstream of the Volga River, where they came across the city of Stalingrad, a key manufacturing and communications center in Southern Russia. Though the oil fields were almost in his grasp by July of that year, Hitler made a fatal error in judgement, one that would ultimately unravel his entire grip on the European continent. Instead of pushing his forces towards the oil fields, Hitler ordered a significant portion of his troops to lay siege to Stalingrad out of a misguided personal vendetta against Josef Stalin. Not surprisingly, Stalin was determined not to let Hitler possess his namesake, and he diverted Soviet forces to defend the city with the simple order "Not a step backwards!" Thus began the Battle of Stalingrad, a bloody six-month conflict marked by street battles and house-to-house fighting that reduced the city to rubble and claimed one million lives. By February of 1943, the tide of battle turned as the Russians took back their city and the Germans were forced to retreat. Indeed, many historians consider the Battle of Stalingrad to be a key turning point in the Second World War-- had Hitler decided to push forward to the Caucasus oil fields instead of trying to capture Stalingrad, the outcome of the European war would have been very different. One of the many heroes to arise from the Battle of Stalingrad was a former shepherd boy from the Ural Mountains named Vasiliy Zaitsev. An expert marksman, Vasiliy was exalted to almost mythical stature by the Russian press and propaganda machine, who wrote of his over 200 kills and uncanny talent for killing his enemies with one shot. One story, which is generally agreed to be apocryphal, tells of SS Colonel Heinz Thorwald, an instructor at a Berlin snipers' school, being sent to Stalingrad to hunt Vasiliy down. According to the story, a two-day cat-and-mouse game ensued, which injured Vasiliy's assistant, a political officer named Danilov, and killed another fellow sniper. Vasiliy ultimately triumphed, and as a trophy, he took the telescopic sight from Thorwald's rifle, which is still on display in the armed forces museum in Moscow today. However, it is generally believed that this story was probably fabricated for propaganda purposes, as there was no record of a Colonel Thorwald in German military records, nor was there any record of such a confrontation in the military reports of Red Army sniper activities. Writer/director Jean-Jacques Annaud ("Seven Years in Tibet") takes the story for "Enemy at the Gates" from this alleged confrontation. In the process, Annaud creates a microcosm of the larger conflict through a handful of characters amidst the debris-strewn streets of Stalingrad. And though the film suffers from some sketchy characterizations and an extraneous romantic subplot, "Enemy at the Gates" still manages to be an impressive war drama that calls to mind the cinematic carnage of "Saving Private Ryan". 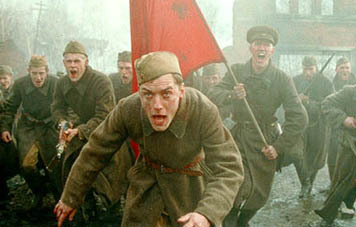 The story begins with the arrival of Vasiliy Zitsev (Jude Law of "The Talented Mr. Ripley") in Stalingrad in the fall of 1942, where he quickly learns that the Russian war effort is not going well. In addition to being outgunned by the German invaders (rifles are in such short supply that they must pair up to 'share' them), the Russian forces are so demoralized that political officers are needed to shout slogans of encouragement to goad them into battle-- as well as shoot those who disobey orders by retreating. Caught between the bullets of the Germans in front of them and the bullets of the Russian political officers behind, hope is in short supply in beseiged city. Despite the grim situation, Vasiliy quickly proves himself to be a sniper of unparalleled skill, which is witnessed first-hand by a local political officer named Danilov (Joseph Fiennes of "Shakespeare in Love"). Sensing Vasiliy's potential as a rallying point for Russian morale, Danilov commissions a number of newspaper articles extolling the sniper's legendary feats. 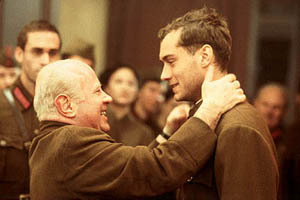 Vasiliy quickly becomes a national hero, and even finds an audience with future Russian premier Nikita Krushchev (Bob Hoskins of "Felicia's Journey"), who has come to Stalingrad to oversee the campaign. 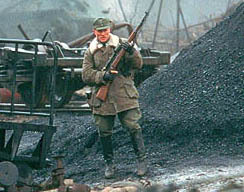 Unfortunately, Vasiliy's exploits also catch the attention of the Germans, who send their best marksman, Major Konig (Ed Harris of "The Truman Show") to hunt him down. Thus begins a life-and-death struggle where the hunter can quickly become the prey-- and vice-versa. Meanwhile, a wedge is driven between fast friends Vasiliy and Danilov by their love for the same woman, a sniper named Tania (Rachel Weisz of "The Mummy"). The films of Annaud have traditionally been visually-rich but narratively-challenged, and "Enemy at the Gates" is no exception. The film is certainly full of spectacle, such as Vasiliy's arrival into the blasted ruins of Stalingrad, in which his landing craft is repeatedly strafed by German fighters, or a sequence where Vasiliy finds himself trapped in a bombed-out department store as bombers close in on his location. In addition, the ruins of Stalingrad are littered with smashed Marxist icons, giving the hellacious setting an almost surrealist feel. However, the script is limited in terms of the depth to the characters and plot mechanics. Though Law acquits himself nicely as a simple man who finds fame thrust upon him, his thinly-sketched character never quite gels, as in how the character of Maximus rose into epic proportions in last year's "Gladiator". Similarly, the motivations of Fiennes' Danilov character seem muddled, particularly when his character seems to have a couple of dramatic changes-of-heart throughout the film that feel tacked-on. Harris, probably one of the most under-rated actors working today, brings his imposing screen presence to bear in his portrayal of Law's nemesis, though not much is revealed about his character, nor what makes him tick. Weisz, despite her role as the obligatory love interest, capably demonstrates her ability to handle more dramatic material, and is appropriately de-glamorized from her appearance in "The Mummy". Furthermore, the film throws in an unnecessary love triangle that not only takes away emphasis from the main story, the battle of wills between Vasiliy and Konig, but also leaves no time for exploring some of the interesting ideas that are raised. Through its Russian characters, the script creates a microcosm for Soviet society and dabbles in illustrating the inequities plaguing the Marxist system, creating rifts between the intellectual and political elite (Danilov and Tania) and 'have-nots' (Vasiliy). In addition, the role of propaganda in warfare is also briefly touched on, though it would have been nice had this idea been explored further, particularly how a symbol can sometimes be more important than the person it represents, or how the propaganda machine can both ways. If you can forgive the narrative stumbles and missed opportunities, "Enemy at the Gates" ends up being a good, but not great, film. Technically-accomplished and artfully-directed, "Enemy at the Gates" is somewhat successful in condensing the sprawling scope of the Battle of Stalingrad down to a very personal conflict between two men-- whose countries' ideologies are not that dissimilar.